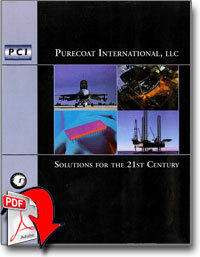 Purecoat International, LLC (PCI) has operated in its present Florida location for over forty years, applying specialized metal finishes to components utilized worldwide by the aerospace, electronics, transportation & microwave industries. PCI commercializes, distributes and applies engineering surface finishes in market niches that demand rigid specification compliance. Purecoat's products and services solve specific application problems, by enhancing the characteristics of the component substrate to improve resistance to wear, corrosion or to improve their conductivity. PCI offers application technology developed to meet high-end military specifications and performs both commercial and military work for regional and national customers.